Please read the Race Details – Race Pack to download will be available soon. Registration will take place at Pendine Sands in the Museum of Speed which is near the Promenade in Pendine from 6:30am. At registration you will be given your race numbers, bike and helmet sticker, security wrist band, a tattoo to be on the right arm and timing chip. British Triathlon members must produce their race licence at registration, or purchase a day licence. Day Licence will be £5.00 each or £3.00 each for Relay Team members. If you are not a member then you will have to purchase a day licence. No licence = no race. No exceptions. 08:45am Race Starts – run beach start. 12:00pm Transition area dismantled / 10 mins after last finisher. Please note that all main junctions will be marshalled and we will have Police to assist with the two bike turns. The roads are open so you will have to abide by the rules of the Highway. It is your responsibility to cycle safely. Anything deemed to be unsafe will be recorded by marshals and the race referee will impose a time penalty or disqualification, as appropriate. This is a beach start for the Pendine Triathlon which involves running into the sea. You will swim an anti-clockwise circuit as the diagram shows and turn left at both buoys. After turning the second buoy you will head back towards the shore and you will have to come in between the two buoys near the swim exit. You will not be allowed to take the shortest route to the shore and run along the sand. This will be a two lap swim. As with all open water sea swims we are at the mercy of the weather conditions. The Race Organiser reserves the right to amend the Course and race format if the weather conditions dictate. This will only be done after full consultation with the Lifeguards, Sea rescue crews and race referee. Before removing your bike from the racking please make sure you have securely fastened your helmet. After exiting Transition you will be asked to mount your bike at the designated mount line. You will then proceed towards the highway A4066. 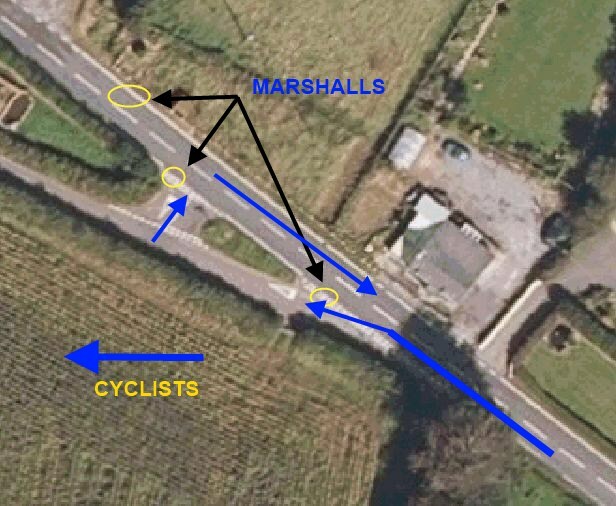 This is a right hand turn so you may well be asked to stop by the marshalls if there are on coming cars. Once on the main highway you will head out towards Laugharne. You will cycle through the village of Laugharne and the turn around point is 2Km outside Laugharne where you will turn left and then right before re-joining the Highway. This will be well marshaled but you do have to obey the Highway code. When you return to the A4066 you will retrace your steps back towards Pendine. This is a two lap course and there will be a fantastic atmosphere waiting for you in Pendine as you start your second loop. When you return the second time you will head back into the Transition area. You will once again be asked to dismount at the line and push your bike into transition. This is a simple out and back 10Km run along the Pendine beach. There will be cones placed periodically as you head out towards the 5Km turnaround point and there will be a marshall present here to make sure you turn. You will keep the cones to your right hand side on the way out and on your left as you return. The Finish Line will be on the new promenade looking over the beach. The transition area will be located on some land near the exit of the slipway. It will be protected and secure with a marshall present at all times whilst transition is open and during the race. There will be bike racking present for you to rack your bike but this will not be numbered. The Transition area will be self explanatory and clearly signed. 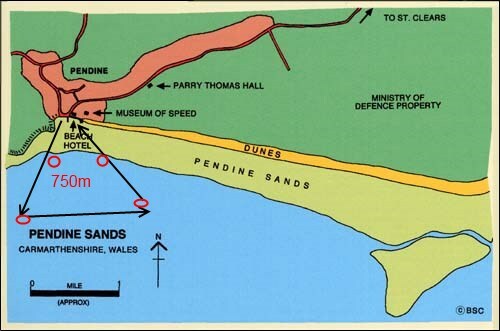 There is a Council owned car park only 100m from Pendine Sands. Please use this which on Sunday. Public toilets are available at Pendine Beach and are free of charge. Your race numbers will be given to you at registration. You will be given two race numbers and you can wear a race belt but you must ensure the race number is visible on the back for the Bike and front for the run. Timing this year will be with chip timing. Please ensure this is safely strapped on. If you don’t wear your timing chip there will be no Race Time for you. The transition area will only be open during the times listed above. There will be NO access to the transition area outside of these times, or before the last cyclist has returned. No-one other than athletes, bearing a security wrist band and bike sticker fixed, will be allowed into the transition area – no exceptions. Bikes must be hooked onto the racking either by the saddle. Your security wrist band must match your bike number in order for you to retrieve it. Medical cover will be available during the race, so in the unlikely event that you need medical attention please alert a race official who will act accordingly. If for any reason you decide to pull out of the race (this includes not starting the race after you have registered), you MUST report to a timekeeper at the finish so that this can be recorded and we know that you are safe. Everyone who starts the race must be accounted for, so please avoid the cost and worry of a missing person search by reporting in. If you suffer from any medical condition (e.g. asthma) please write details on the back of your race number. This should help ensure you receive the correct treatment in the event of any emergency. Water and bananas will be available at the finish. You will also receive your Finish Memento here. If the weather is very poor then your Race Momento can be collected from the Registration area at the Museum of Speed. Please collect your bike and kit from transition as soon as you can after transition has re-opened (as soon as the last runner is out on the course). You will need to have your security band on to access to transition and remove your equipment, and this must match the one on your bike, so please don’t lose it. Penalties will be posted in a prominent position and any appeals must follow the procedure outlined on the day. Drafting is always a problem with triathlons especially when the entry field is quite large. We will have a motorcycle referee and they will take the race numbers of any cyclist drafting. At the race briefing all athletes will receive there first formal notice, anyone caught drafting on the bike course will then be immediately disqualified. The presentation will take place at the beach side cafe in Pendine as soon as possible after the last finisher. Prize categories will be 1st Male & Female in all Categories. Depending on entry numbers this may be extended to 2nd & 3rd positions as well. 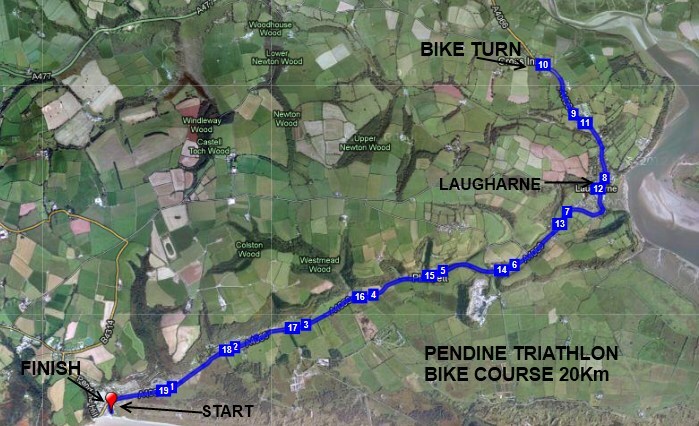 Many thanks to yourselves as athletes for supporting the Pendine Standard Distance Triathlon.